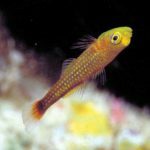 Scientific names are meant to convey meaning, but sometimes that meaning can get lost or obscured over time. An excellent example of this phenomenon can be seen with the Clown Coris or Twin-spot Wrasse, Coris aygula. 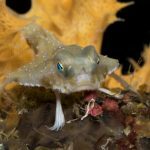 In the annals of fish nomenclature, this is the only species to have ever been given the unusual epithet “aygula”… but what, dear reader, does this rather curious name mean? In my quest for an answer, I searched high and low for some etymological catharsis, from Google and wikitionary to my heavily abused copy of Roland Wilbur Brown’s indispensable Composition of Scientific Words, but all to no avail. Whatever an “aygula” is or was seemed to have been forgotten by mankind, lost to the sands of time. Though the name is sui generis, there are a few other creatures whose binomial is clearly cognate. For instance, there is the Dung Beetle Onitis aygulus Fabricius 1781 and the Beefly Anthrax aygulus Fabricius 1805. The -us ending here might suggest a masculine suffix in Latin, but the word doesn’t seem to originate in that language, perhaps meaning this was a Latinization from some foreign tongue. Even more germane to this discussion is the Crab-eating Macaque (Macaca fascicularis) and the Grizzled Leaf Monkey (Presbytis comata). 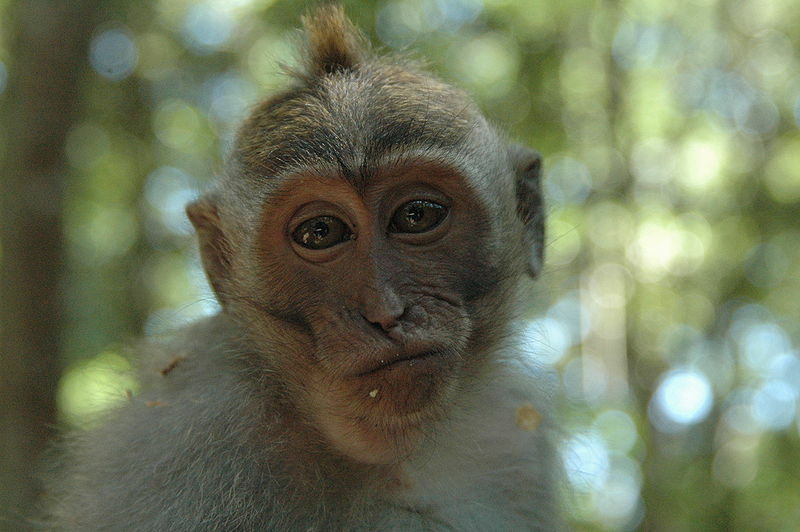 The macaque was originally described in 1758 by none other than Carolus Linnaeus, the father of zoological taxonomy, as Simia aygula, but the story gets confusing from here. For reasons that aren’t entirely clear, this name at some point began to be associated with the leaf monkey, and you’ll find a large literature that incorrectly makes mention of Presbytis aygula. 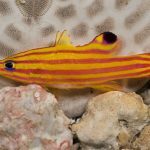 We’ll get back to the macaque in a moment, but, for now, let’s move on to our wrasse. 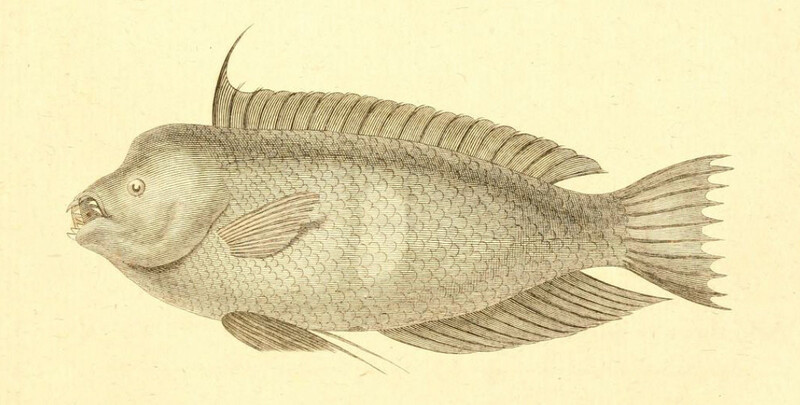 Illustration of Coris aygula from Lacépède 1801. Note the dorsal fin shape. Unlike so many of his peers at the time, Lacépède tended to be rather verbose in his descriptions, allowing us to decipher the meaning behind his names. 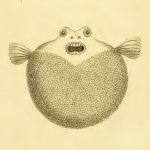 For Coris aygula, he was not only describing a new species, but a new genus as well, using specimens collected by another earlier French naturalist, Philibert Commerson (of frogfish fame), who had been aboard Bougainville’s famed expedition which successfully circumnavigated the oceans. Relying on Commerson’s written description of fresh specimens and a couple dried skins, Lacépède paints a pretty accurate picture of what this species looks like as an adult, though, without any fresh material to work with, there is little said concerning its colors. If you were to consult with fishbase.com right now, it will tell you that Coris is derived from the Greek “kore”, meaning “pupil or maid”… but this is quite wrong. As Lacépède makes clear, the name apparently originates from Commerson’s unpublished field notes and comes from an unspecified Greek word meaning “summit or head”, in allusion to the bulbous swelling that develops atop the head of large males. 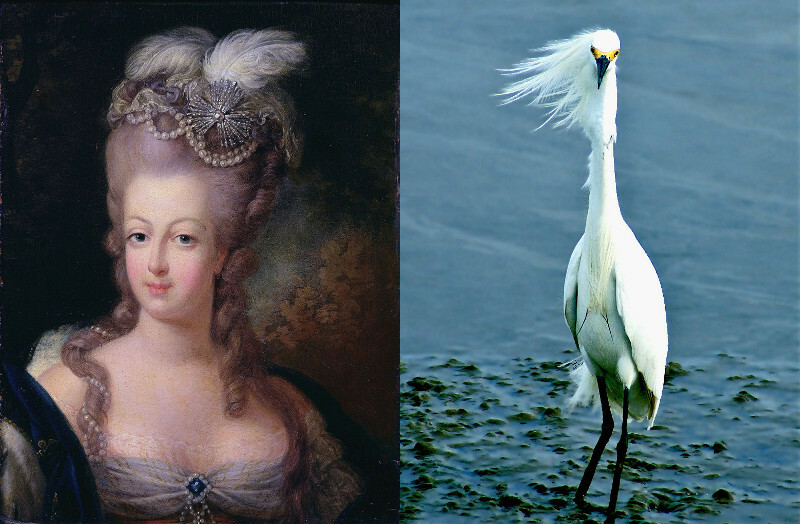 For the epithet aygula, the derivation would appear to be from the French aigrette, which refers to the ornamental feathers that adorn the head of egrets, and, in turn, this can be used to describe any similarly ostentatious headdress. This etymology clearly makes reference to the extravagant dorsal fin spines of Coris, which can be raised prominently in a very egret-like manner. 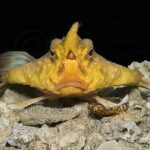 And it’s here that I’ll mention that there is one other fish which did formerly share this name—the Hogfish (Lachnolaimus maximus). It was mistakenly redescribed by yet another Frenchman, Achille Valenciennes, who named it Lachnolaimus aigula. As with the Clown Coris, this species also has the anterior spines of the dorsal fin greatly exaggerated, producing an egret-like headdress of even more dramatic proportions and confirming the meaning of this epithet. 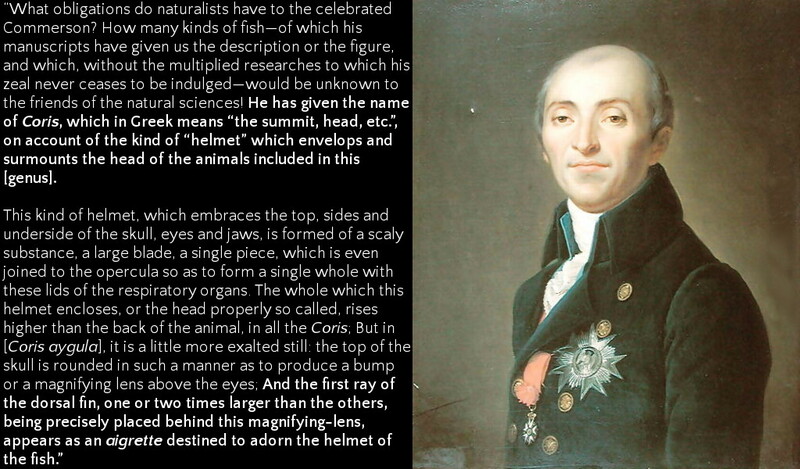 So aside from Linnaeus, who was a multilingual Swede, every other species which has been given this peculiar name was originally described by a Frenchman (and, more specifically, by a late 18th or early 19th-century Frenchman). It would seem that as elaborate headdresses became less and less of a fashion statement, they also became less influential in the world of zoological nomenclature. Looking back at the other species bearing some variation of aygula, we find that the dung beetle has a short horn above its head… the fly has a bit of setal fluff between its enormous eyes… and, as for Simia aygula, the Crab-eating Macaque, it sports a cute little punk-rock mohawk. Appropriately enough, this species is alternatively known as the Egret Monkey, which brings us full circle on our linguistic journey. Thanks for the interesting etymological post! I found myself wondering what the “aygula” in Simia aygula meant while researching my mammalian etymological dictionary, so thanks for the heads-up to Lacépède’s description!